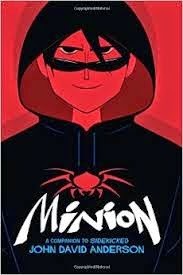 Minion, by John David Anderson (Walden Pond Press, June 2014, upper middle grade, but pushing toward YA), is a riveting tale of a 13-year-old kid with super-powers, set set in the same world as last year's Sidekicked, but with all new characters. Under different circumstances, Michael could have been a super hero, or at least a sidekick. He has the power to control people's minds (if he's making eye contact, and can keep his focus...). But Michael wasn't raised to be one of the good guys. Plucked from a Catholic orphanage while still a boy, he was adopted by a brilliant inventor who sells his creations to the highest bidder. The inventions are not of a warm, fuzzy sort, and the bidder in question is the head of one of the local organized crime syndicates. And Michael's new dad isn't adverse to using the power of mind control to keep the cash coming in between inventions. But Michael loves his dad, and after all, his powers aren't really hurting anyone much....and so he lives a somewhat lonely life, homeschooled and isolated, hanging out with a crime family minion, hypnotizing strangers at ATMs, and helping out on the experiments in the basement. Then a new type of crime comes to town--one that transcends ordinary thuggery. And there to stop it is a new superhero--the Blue Comet! The clash of superhero and supervillian shakes Michael's world to its foundations. Michael's powers and his dad's almost preternatural inventing genius become valuable commodities in the struggle....and Michael finds himself faced with a choice that will change the course of his life. Minion....or good guy, whatever good guy might mean. It's an interesting premise--this whole question of good vs evil--but it's by no means a heavy-handed moral story. Instead, it's more like a mystery with nuance. Things grow progressively more complicated, what with hidden identities, villains hatching plots, and the family secrets that Michael didn't even know were there. This tension, coupled with a cast of (mostly) likable, always interesting, characters keeps the pages turning nicely. Disclaimer: review copy received from the publisher as part of the Minion blog tour--there's one last stop tomorrow, at Literacy Toolbox! Ooh, going on my goodreads to-read shelf right now! Fun. I really liked Sidekicked, so I can't wait to read this one. I've been on the fence about this one--do you think it falls more into YA than MG? It's very distinct from SideKicked in a lot of ways, and there's an interesting father-son relationship for sure! I think I like it, but I don't think I love it like Sidekicked.